This post is part of the Game-Like Mechanics series. Developers of social platforms hope to engage users through basic game mechanics like points, levels, and leaderboards. While these features can create initial draw, they don't often lead to sustainable engagement. This is because points, levels, and leaderboards treat users as a homogenous group of competitors who relate in a basic way. In contrast, successful social platforms support heterogenous user groups who relate in rich and complementary ways. Much like in fashion, the internet has few innovators and many imitators. It isn't that innovators create new features and imitators copy them. Because everything is remix. What separates the two groups, as in fashion, is a difference in taste level. Innovators design products that feel elegant and editorial, while imitators' products are poorly executed - a mashup of features that don't hang well together. In the fashion world, one legendary innovator possessed good taste beyond compare. Defined by her taste level, the fashion house she founded has stood as a paragon of luxury for a hundred years. Her name is Coco Chanel. Most people know her as a fashion designer. Less widely appreciated is the fact that Coco Chanel herself was a philosopher of taste. Not many people think of email as a game. After all, games are meant to be fun. Email, on the other hand, is laborious and stressful and makes you stop breathing. But email has at least one game-like quality - the thrill of victory when you defeat your inbox, achieving Inbox Zero. It's like slaying a dragon, man. If you think that's hyperbolic, consider Merlin Mann's preface to Inbox Zero - a veritable player's guide to email: "It’s about how to reclaim your email, your attention, and your life." Email is a game of numbers where progress is measured by a single statistic - the count of unread messages. Whereas we're pleased to see many stats (points, followers, @mentions) count up, we battle desperately to keep the number of unreads in single digits. As email became ubiquitous, the unread indicator became iconic. Web and mobile apps adopted it for their app-specific inboxes. More recently, the arms race toward gamification has emboldened app designers to try the unread indicator in ever more aggressive contexts. Unread tweets. Unread system notifications. Unread recent activity? Things have gotten out of hand. As with all design patterns, the unread indicator can be used well, and it can be overdone. The rest of this post discusses some key considerations surrounding the indicator's use. Video games offer a possibility rarely had in real life - the satisfaction of being truly madly deeply 100% complete. Beating Grand Theft Auto IV will take two weeks. But then again, the main story line is only 68% of the game. To reach 100% complete, you'll have to finish umpteen side quests, like chasing down 200 pigeons, and meeting random pedestrians. It can take hundreds of hours. And the prize for getting 100% complete? Well, there isn't one really. In fact, 100% completions rarely lead to big juicy rewards. At most it helps unlock an easter egg. 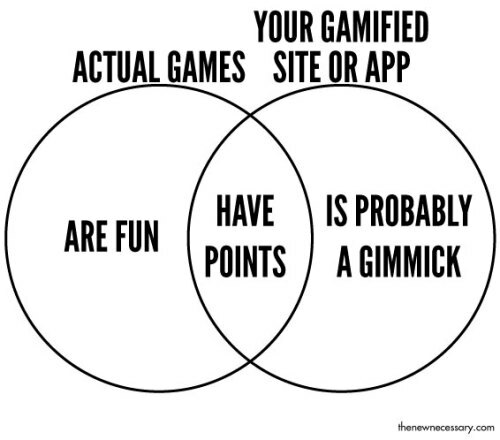 Product people in consumer internet have game envy. Everything should be as fun and engaging as Super Mario Kart. This agenda is emboldened by the success of Foursquare - the half-app, half- alternate reality game. Game mechanics such as points, leaderboards, badges, and mayorships are what make Foursquare more engaging, addictive, and successful than all the other location apps. Now other apps are eager to jump on the game mechanics bandwagon. Badges, for example, are suddenly cropping up everywhere. But in some cases, their use feels contrived, or even worse, users begin to feel manipulated. It's important to realize that explicit game mechanics may not be appropriate for all apps. Instead, consider incorporating game-like mechanics to engage users. These are design patterns that come from videogame theory, but importantly, they aren't overtly videogame-y. Since they don't cry out: "I'm from a video game," game-like mechanics may be suitable for a broader range of apps. By the end of May 2010, Apple exceeded Microsoft by market capitalization to become the largest tech company in the world. Cue sinister music. Are they now too big to fail (at design)? I am a dyed in the wool Apple devotee who daily asks himself questions like "What would Jony Ive think of this UI?" So maybe I've been spoiled by Apple's long streak of design genius. Or maybe I've gotten pickier with my pixels. But I was disappointed to encounter several usability flaws in iPhone's OS 4 update. It's tempting to just point out the flaws and excoriate Apple for losing its way. But usability design is tough enough. It doesn't call for back-seat driving. So I've cooked up simple design fixes and workarounds. There are, of course, more elegant solutions out there and I hope you'll chime in with your ideas in the comments section. 1. ZOMG Folders are Cluttery! Imagine if all the desk drawers and organizers in your house were completely transparent. You might go crazy staring down your stuff. That is how I feel about the appearance of folders. Internet-y people use the term 'curation' to mean the process of finding, filtering and organizing digital artifacts according to one's tastes. If you've ever filled out a social network profile, hearted a track on last.fm, or rated a movie on netflix, then congrats, you've unlocked the Curator Badge! Two weeks ago, Silicon Valley Insider pronounced with great fanfare that Content is No Longer King: Curation is King! "King Content is dead! Long live King Curation!" you can hear the Interwebizens Liking from their Second Life villas. This got me excited too, albeit for a different reason -- I love words and their agency. I love that the metaphor of curation is being embraced by the internet. Hey interwebizens! Welcome to my relaunched blog. I blogged from 2003-2005 about identity, aesthetics, and semiotics. It was an interesting experience, but I have to admit that I never got the hang of it. My posts were too long, too academic, and sometimes too indulgent. Well, fixed, fixed and fixed. I want this rebooted blog to be a fun and inspiring read. You can expect 1-2 posts per week, so you can safely add me to your RSS reader. I'll blog about what I know -- taste science, product design, and internet life. And I'll look forward to following up with you via comments. So again, welcome to my taste blog! Housekeeping note: In the interest of continuity, I'll be slowly (read: manually) importing my old blog posts from 2003-2005. Caveat lector: these aren't much related to the new blog. Treasure your idle thoughts because they are the only thoughts which are truly yours. That grand realization you had that later you realized was obvious-- don't discount those. It really was a grand realization; and the one who discounted your achievement was not you, but society censuring through you. What ever happened to the subject in aesthetics? What ever happened to the subject in "aesthetics"? Kant, in his Critique of Judgement, proclaimed that perception of beauty was more concerned with form than function or content. Hence the formalism tradition of aesthetics, born in Plato and Aristotle, was reinvigorated with Kant's claims of aesthetic universality, and along this line, aesthetics developed into the branch of philosophy that saw itself more often concerned with social and impersonal art criticism than joie de vivre; it fell away from 'experiential philosophy, the spirit of Europe', as Kundera put it. Proto-sociologist Georg Simmel was perhaps the first scholar to embark on an in-depth exploration of the nature of self in relation to society and culture. For Simmel, society and culture provide many prototypes which are various social forms appropriate to the characterization of aspects of self; however, such characterizations are ultimately incomplete and there will always exist parts of the self which lie outside definition and social entanglements. This private self is not completely knowable, but craves to be realized and expressed via social and cultural forms. Simmel poses the self as a series of dualities including social-versus-private, objective-versus-subjective, and conformity-versus-individuation. In my interpretation, the spirit of Simmel's theory of self can be collapsed onto a single duality: identity-versus-individuality. Interestingly enough, these two words are often used interchangeably and haphazardly in the literature, but as I will show, these binary opposites endpoint a whole spectrum of nuanced understandings about the self, achieved in the literature. Throughout intellectual history, countless psychologists, linguists, and philosophers have touched upon the subject of emotions, and many have proposed ontologies for them. In The Cognitive Structure of Emotions, Ortony, Clore, and Collins (OC&C) give a particularly lucid discussion of the shortcomings and gaps exhibited in the prominent theories of emotions which have arisen in prior work, and then themselves propose quite an elegant and well-elaborated framework for emotions. Their framework is at once intuitive and predictive, and bears implications for the computation of emotions.